About six hours ago, a man in his twenties drove a truck into a pedestrian zone in Akihabara electric town and went on a stabbing spree, where 7 people were left dead and 10 injured. I saw this on the news before going out for the day, and as I rode past Akihabara station on the Hibiya line I wondered if the station would be pandemonium but it actually seemed more quiet than usual, especially for a Sunday afternoon. Once I got home and watched the news again, it was clear from the footage that the station was empty because everyone was crowded around the intersection where it happened, watching the police clear away the mess. I've noticed this before, but the news in Japan always features blood. If there is a murder or some kind of accident, you can be sure there will be a close up of the blood on the pavement. I didn't watch TV for several years before coming back to Japan, so I don't have anything to compare it to, but I can't ever recall seeing blood shown in such a way on the news. I don't think I can expect people to look away at the scene of an accident, I've certainly done my share of neck craning to see an accident, but zooming in on a victim's blood and blood drenched medical equipment seems a bit sick and disrespectful to me. If I was the victim or the victim's family, I certainly wouldn't want my blood on the news. 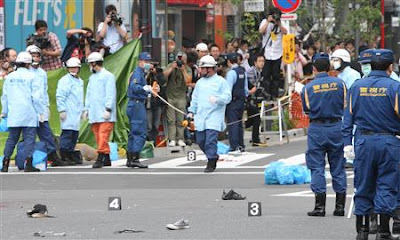 The killer who was nabbed by the police a short time later apparently said that he had come to Akihabara to kill people. Who is this guy and how did he manage to kill seven people with a knife??? I understand it was crowded as Akiba always is on a Sunday but the logistics of it are a bit mind-boggling: how did he manage to get around to so many people without either alerting others to the fact that there was a lunatic brandishing a knife, or causing enough of a scene for people to start running away? I mean, he drove a big moving truck into a pedestrian zone, hopped out and started stabbing people. It will be interesting to see what happens after this to ideas about public safety in Tokyo. Akiba is known as many things: tourist destination, electronic town, home to maid cafes and street performances by young female idols that reclusive and nerdy men flock to. And today it will also be known as the scene of a massacre. I can't help but think there but for the grace of god...I've been a pedestrian several times there in the last few months, shopping for things to make my life more comfortable and looking at the nerdy men with cameras in disgust.